Do you see some value here? The chance for thousands of people to view your information and opt in to your list. Really great marketers who have deep marketing funnels and say that incredible follow up can achieve $1 and more income from each of their list of email subscribers. Example: That’s $1 X 1000 (your list size) = $1000 a month – now a 1000 ideal people on your list is a great start. The quality you offer, relationship-building, and serving your email list subscribers. It’s all down to the 3 R’s relationship, relevance, and responsiveness. Targeting your ideal audience for your list. – Depends on your lead magnet, the bribe you offer to get them to sign up. – How badly do these people want whatever you’re offering them? – The copy of your email follow ups. – Grow those relationships with them so they trust you and know that you’re looking out for their best interests. Okay…Let’s get back to how to explode your list with a Joint Venture Giveaway. Pick a Joint Venture Giveaway event that is in your niche with a common need. Your blog or website is your authority base – the hub of your content. Fulfill your promise of offering information/secrets of great value. Something to give away. This is your lead magnet that you’ll pull them in with and it’s got to be something they really need/want to have in trade for an email address from a lead. This is the “Gifts” part that you create for the Joint Venture Giveaway. A squeeze page for your gift. This can be an optin page on your blog or website that you send them. An Account with an autoresponder. I like Aweber (my affiliate link) ~ inexpensive, tremendously easy and wonderful service. A way to deliver the free offer (your gift). You can deliver it through your email to your audience. Or you may set up another page with your gift and message to them. Don’t have a Lead Magnet for a Joint Venture Giveaway? Let’s get you ready to create your lead magnet offer! You can build a lead magnet as a valuable free giveaway that you create for your ideal audience. If you want? 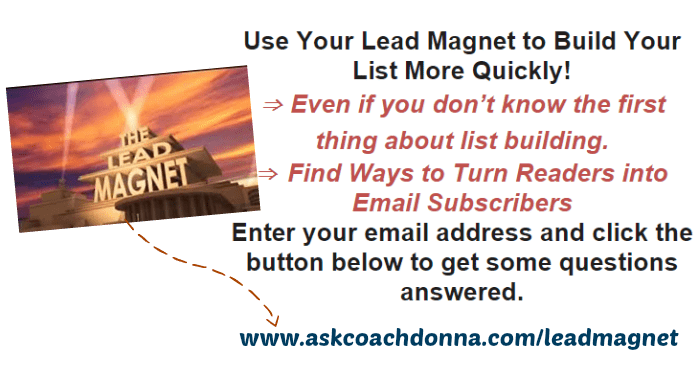 We can to show you how to create YOUR OWN LEAD MAGNET guiding you step by step to get it done and pull in your audience onto your email list. Please note this post includes an embedded Affiliate link. This means if you click on the link and purchase an item, I will receive an affiliate commission and go out and buy lots of stuff, even as I have so much fun! For more information please visit my Disclosure Page.